Where Can I Bet On Wayne Rooney Leaving Manchester United? - Casino Answers! Casino Answers » Sports Betting » Where Can I Bet On Wayne Rooney Leaving Manchester United? Where Can I Bet On Wayne Rooney Leaving Manchester United? Well, it’s all over the press, not just in the United Kingdom, but across the sporting world. Sir Alex Ferguson has confirmed that Wayne Rooney wants to leave Manchester United as soon as possible, which means a January exit could be on the cards for the temperamental Scouser. You’re probably thinking to yourself, “Why should I care?” Well, there is a fantastic betting opportunity out there for anyone that wants to have a bet on where Wayne Rooney will play next. You can bet on what club Rooney will play for next, when he will leave and how much his transfer fee will be. The bookies have been quick to price the markets up in light of Sir Alex Ferguson’s revelation and as time goes on, there will no doubt be more and more markets. However, the pick of them and the most interesting is undoubtedly the market for which club Wayne Rooney will be playing football at next. However, first up is the question – Will Rooney stay at Manchester United during the January transfer window? Paddy Power are market leaders with a very generous 1/2 on Rooney leaving Manchester United, while other bookmakers are far shorter on Wayne Rooney leaving his club. Surely this is a huge price considering the star has said he want to leave and Sir Alex Ferguson has a history of selling anyone that steps out of line, regardless of who they are. David Beckham and Roy Keane instantly spring to mind. Rooney will go, it’s just a question of where, not if, surely. Which brings us on to the great market – Which football team will Wayne Rooney play for next? This market is fantastic, because you get hilariously low prices and also some terrific value out there. Stan James has the most interesting prices out at the moment, with Manchester City favourites to land Wayne Rooney signature at 6/4. But would Rooney go across the city to play for United’s arch rivals? 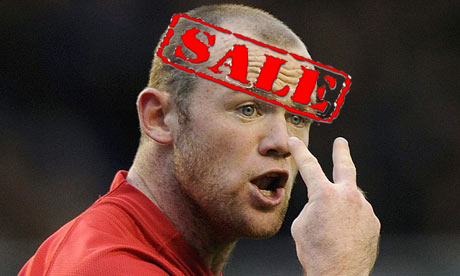 The only thing worse would be signing for Liverpool, who are currently 100/1 to get Rooney to stay in red. Current European champions, Inter Milan are a very interesting proposition at 16/1, with their Milan counterparts, AC Milan, currently sitting at 20/1. The other European super-powers, you know, the ones from La Liga are second and third favourite, with Barcelona 6/1 and Real Madrid half the price at 3/1. And if you think Rooney and his family will stay in England, but in the capital instead of the North West, Chelsea are 5/1 and Arsenal are 33/1 to land the young striker. A move back to Everton is currently 66/1 and if you fancy a big punt on Rooney joining David Beckham at La Galaxy, you can have a punt at 100/1, although I think that might be a bit on the short side. All this is available here. William Hill are currently betting on what transfer fee Manchester United will get for Wayne Rooney, with £6m-£10m the market leader, although nearly every option is around the 3/1 or 7/2 mark, with £31m-plus being 7/2, which might be interesting seeing as though there will be a lot of clubs bidding for Rooney. And if you fancy having a punt on Wayne Rooney still being at Old Trafford next season, Ladbrokes are going 2/1 on him being in Sir Alex Ferguson’s plans for the 2011-2012 season. Whatever the outcome, it’s going to be a fun time with a lot of speculation and rumour floating around until a deal is done. Will Wayne Rooney leave Man U? Bet on Rooney leaving Man Utd?